Modern retellings of opera stories are always interesting to explore. 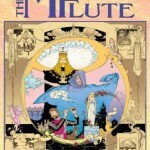 A few weeks ago, at a library, I discovered a 1990 graphic novel retelling of The Magic Flute, by the famous comic book creator P. Craig Russell. In addition to being beautifully illustrated, with a fluid, emotionally charged and atmospheric style of art, this retelling of Mozart and Schikaneder’s lofty-minded fairy-tale is fascinatingly written. Russell plays fast and loose with the opera’s libretto: unsurprisingly, since Flute has one of the most controversial librettos in all of the standard repertoire. The result is a very inventive new version of the familiar story. *The influence of the Ingmar Bergman film is enormous. Not only does the retelling borrow several of Bergman’s changes to the plot, even the artwork’s color scheme is highly reminiscent of Bergman, with its predominance of light, friendly oranges, yellows and golden browns interspersed with scenes of truly bleak, eerie darkness. 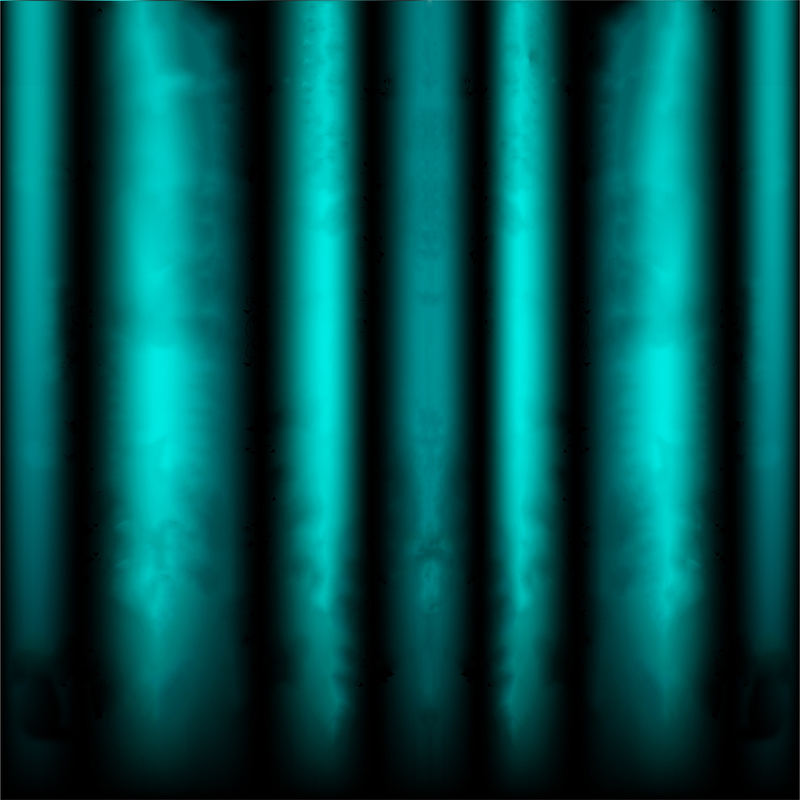 *Some of the sequences are reordered. The flute’s enchantment of the animals happens before Tamino finds the temples rather than after, as in the Bergman film Papageno encounters the “old woman” only once rather than twice, and as in Bergman his reunion with Papagena comes before Tamino & Pamina’s final trial rather than after. *The Three Ladies and Three Boys are omitted. The Queen of the Night herself gives Pamina’s portrait and the magic instruments to Tamino and Papageno, Tamino finds the three temples by himself, and Pamina’s suicide is prevented by a floating, red-robed female figure, never named, but whom I interpreted as the spirit of love. *The giant serpent/dragon is omitted, so we’re spared the opera’s strange introduction of its brave hero as a terrified, fainting victim. Instead we open with Tamino sleeping on the ground, dreaming a strange dream about women and birds (which foreshadows the proceeding story), only for a curious Papageno to wake him up. This Flute isn’t free of dragons, however (see far below). *Papageno loses most of his naïveté and softness, instead having a more streetwise (forest-wise? ), deadpan snarker personality. He’s still as cowardly as ever, though. His characterization reminds me more of Leporello than a traditional Papageno, or possibly of Rizzo the Rat from the Muppets (albeit more feathery). *Tamino, rather than the opera’s pure and slightly boring hero, is a little silly at first. He tries too hard to be a stereotypical fairy-tale hero, making flowery declarations while striking a goofy “chivalrous” pose, and emphasis is placed on his arrogance and the humility he needs to learn. Papageno, for all his own foibles, comes off as much more down-to-earth and intelligent, at least at the beginning. *Monostatos, though still portrayed as black, is Sarastro’s captain of the guard rather than his slave. *Predictably, the opera’s misogynistic passages are eliminated: on the contrary, the unity of man and woman is expressly portrayed as the ultimate virtue and light. We learn that Sarastro’s order once included both men and women, but that the Queen has captured all the women with black magic and turned them into birds to do her bidding. The loss of women, and with them unions of love, has weakened the order, so that it lies on the verge of defeat by the Queen. Tamino and Pamina are presented as the last desperate hope for its salvation. A worthwhile PC change from the opera, which feminists often angrily label a celebration of an all-powerful masculine order that easily triumphs over female rebellion. *Pamina’s suffering is explicitly portrayed as a form of trials that lead her to spiritual awakening. She is shown, even before her mother commands her to kill Sarastro, to be torn between her love for her mother and Sarastro’s noble ideals (unlike in the opera, where she wants only to go back to the Queen until the dagger scene). When Sarastro discovers her with the dagger, rather than giving a speech about love and forgiveness, he turns his back and stands motionless, saying “Do what you must,” and by herself Pamina makes the decision not to kill him. Most strikingly of all, when the red-robed spirit prevents her suicide, she does not assure her of Tamino’s love, but instead tells her that Sarastro’s community needs her, and encourages her to love Tamino unselfishly and assist him even if she gets nothing in return. Only after resolving to selflessly embrace the light is Pamina rewarded with the revelation that Tamino loves her. *The Disc of the Sun is omitted. This is just as well, since the opera never really explains what it is or what power it has. *As in the Bergman film, Sarastro is revealed to be Pamina’s father. 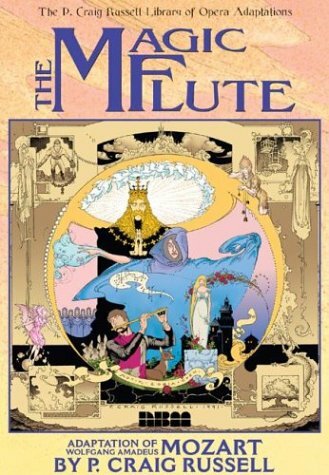 No surprise there – virtually every modern Flute retelling (book, movie, ballet, etc) has made Sarastro Pamina’s father. Unlike the Bergman film, however, this version tells us his and the Queen’s back-story. The Queen, we learn, was once good, but over time she became proud and power-hungry, and “went to the dark side,” so to speak. Sarastro partly blames himself – his duties of office led him to neglect his wife and fail to notice the changes in her until it was too late. Eventually she left Sarastro, taking baby Pamina with her, and started a rebellion against his order. *Tamino and Pamina’s final ordeal is rewritten completely. The trials by fire and water are eliminated. Instead, Tamino and Pamina’s task is to confront the Queen in her caverns, offer her their forgiveness and try to lead her back to righteousness. Of course, the Queen won’t listen. She sends her flock of birds to attack Tamino – but when Tamino plays the magic flute, the Queen’s spell is broken and the birds change back into the women from Sarastro’s order. Not to be defeated so easily, the Queen changes herself into an enormous dragon (ripoff of Disney’s Sleeping Beauty, anyone?). Then Monostatos hits Tamino on the head, snatches the flute, and snaps it in half! But instead of being destroyed by the breaking, the flute’s magic is unleashed in all its enormity. The flute transforms back into the ancient, sacred oak from which it was originally carved, and the tree takes root and grows gigantic. It destroys both the Queen’s cavern and Sarastro’s temple, symbolizing a return to the perfect harmony that existed before hierarchies and power-lust interfered. The Queen, still in her dragon form, is crushed to death under the rubble. *The final couplets of text, pronouncing the moral of the story, here praise unity rather than “the triumph of the strong.” Obviously, this is in keeping with Russell’s previous alterations. I think it’s a bit odd, though, that Russell has Papageno speak the moral – a little out of character, it seems. Though it does lead to an endearing final image of Papageno playing his bells to celebrate the happy ending. Some of the changes I like, some I don’t, and some I could take or leave. But whether I like them or not, it’s fascinating to explore the ways that Mr. Russell rises to the challenges that Flute presents to adaptors. I don’t necessarily approve of the fire and water trials being omitted, but I understand why Russell did it: he probably thought the opera’s Tamino and Pamina win their victory too easily, as well as wanting the climax to involve a direct confrontation with the Queen). The scene that replaces it works well, even if it does rip off a few fantasy movies. I also might wish for a little less Bergman influence, but still, I can accept it. There seems to be an unwritten rule that every modern Flute retelling needs to be based as much on the Bergman film as on the original opera. The one change I especially like is Pamina’s new character arc of trial and spiritual growth, particularly the implication that she feels torn from the start between her mother and Sarastro. The original Pamina, though of course I love her dearly, arguably reflects some dated ideas about women. Virtuous though she personally is, she sometimes seems to care very little about good or evil in others, but just wants to be loved, whether by her mother or by Tamino, Sarastro and co. I like that this version instead has her fully embrace the same lofty ideals that the men do. As much as I adore the original opera, I’ll admit that the libretto is problematic in many ways. To make it fully coherent and palatable for a modern audience, and for the page instead of the stage, must be a daunting task, especially without Mozart’s magnificent music to compensate for dramatic shortcomings. All in all, Russell does an excellent job.